Although remaining focused on the road while driving is necessary in order to safely operate a motor vehicle, many drivers may become too confident and relaxed behind the wheel and find themselves becoming distracted instead of paying attention to the task at hand. When this occurs, distracted drivers are placing themselves at risk, and also their passengers and other motorcyclists, pedestrians, bicyclists, and other drivers as well. Distracted driving can include reading maps or other materials, watching movies, eating or drinking, grooming or brushing hair, adjusting the radio or other in-vehicle controls, talking on a cellular phone, and texting while driving. Any time a person’s attention or eyes are focused on anything other than the road, he or she is at risk of a crash, as are others who may happen to be in the driver’s vicinity. According to the National Highway Traffic Safety Administration (NHTSA) and Distraction.gov, 387,000 people were injured and another 3,331 were killed in 2011 because of distracted driving accidents. Those who have been injured or who have suffered the loss of a loved one understand that numbers are more than statistics; there is a painful cost to be paid when distracted driving collisions occur. Drivers using a handheld device when behind the wheel are four times more likely to be in a car accident than those who are focused on the road. A Pew research poll found that 40 percent of teenagers acknowledged that they had been passengers in vehicles with drivers using their cell phones. Distracted driving was reported in 11 percent of cases of individuals younger than 20 years of age who had been killed in car crashes. 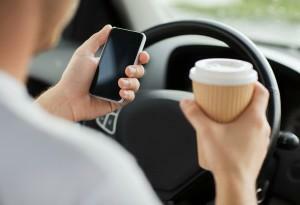 In 2010, 18 percent of injuries sustained in all types of car accidents involved a distracted driver. Distracted drivers who are failing to pay attention to the road are more likely to lose control of their vehicles, veer off the road, change lanes without looking, and hit motorcyclists or pedestrians. Unfortunately, despite the inherent dangers that distracted driving poses, it is not against the law to eat or drink in a vehicle or to adjust the volume on the radio. Police officers and other officials would have a difficult time implementing and enforcing the law and would often struggle to prove that an individual was driving while distracted. Still, drivers are expected to operate their cars with a reasonable degree of care and caution. If a driver acts irresponsibly or negligently while behind the wheel, he or she may be held liable for any and all costs associated with the resulting accident such as emotional distress, lost wages, medical expenses, and pain and suffering. If you or a loved one have been hurt or killed in a car accident and you believe that distracted driving was the cause, consider seeking legal counsel from an experienced Georgia personal injury attorney who can help you seek the compensation to which you may be entitled. Distracted driving may have affected you or a loved one, resulting in injuries. Please contact us at Van Sant Law so we can help you. You may be eligible for compensation for the injuries you or a loved one has suffered. Call us today.